With iOS 6 many users are noticing that Facebook birthday and events are polluting their personal calendars on their iPhones and iPads. By disabling and hiding this data, you can return your calendar to its previous look and feel. Apple integrated Facebook deep within iOS with the latest update. Many users have first noticed this when seeing Facebook events and birthdays from Facebook friends populating their calendars. Other people are deleting their Facebook information from their iOS device to try to get rid of this information. 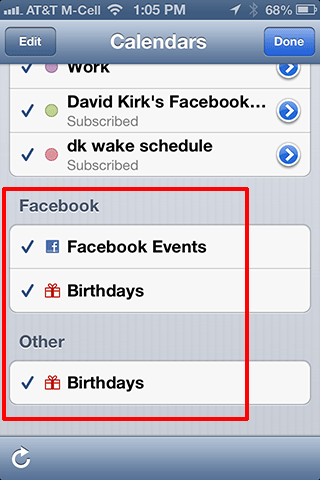 Luckily, you can easily hide the birthdays and Facebook events while keeping the other Facebook features enabled. 1. Open the Calendar application on your iPhone, iPad, or iPod Touch. 2. Click the Calendar button in the upper left hand corner of the screen. 3. Under the Facebook section, uncheck Facebook Events and Birthdays. 4. Additionally, if you have allowed your device to copy Facebook birthdays into your Contacts, you may want to uncheck the Birthdays option under the Other section.